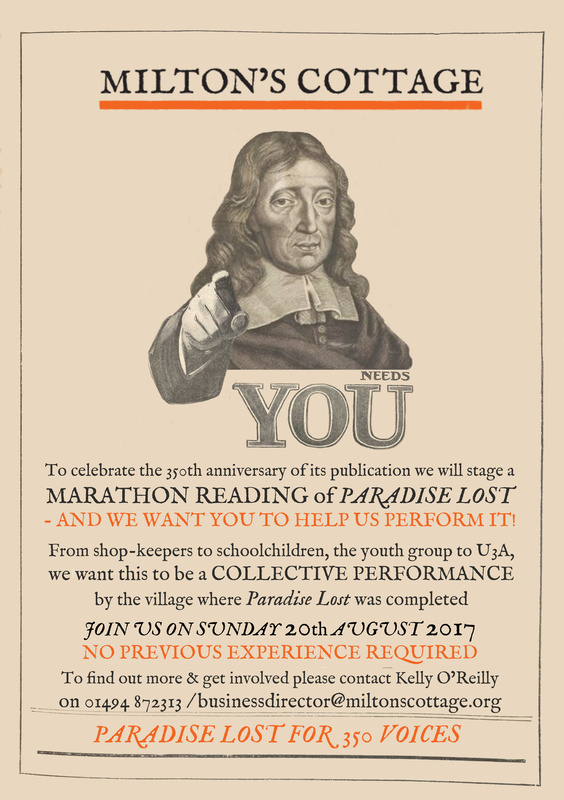 On Sunday 20th August, a cast of 350 will embark on a unique promenade performance of John Milton’s Paradise Lost at Milton’s Cottage in Buckinghamshire, the only surviving home of the visionary poet, revolutionary thinker and parliamentarian. At over 10,000 lines of verse, the reading will take approximately 11 hours to complete. Performers will include local residents – shopkeepers, children, community groups – and Milton enthusiasts from across the country. The celebration will mark 350 years to the day since Milton’s publisher, Samuel Simmons, registered the copyright for the now legendary poem with Stationers’ Hall in 1667. The 16th century cottage in Chalfont St Giles, a museum since 1887, is where Milton completed Paradise Lost aged 58, having fled the Great Plague in London, and where he was inspired to write its sequel, Paradise Regain’d. After Shakespeare’s birthplace, it is the second oldest writer’s home museum in the world. The Grade I listed building houses a range of priceless artefacts, including a first edition of Paradise Lost, the Milton chair, a lock of Milton’s hair and an original proclamation, issued by Charles II, banning Milton’s books. On the same day as the reading, Milton Cottage Trust CIO – an independent charity – will also launch a fundraising campaign for the £3.5 million Paradise Maintain’d Endowment Fund, to secure the museum’s future and preserve its unique collections. The Trust has recently been awarded a Heritage Endowments grant of £250,000, meaning that the Heritage Lottery Fund will match-fund every donation to Paradise Maintain’d up to that figure. The last time a public appeal took place was around its launch in 1887. The first donation, of £20, came from Queen Victoria; the Trust is asking donors to match the royal sum to help them towards their goal. Paradise Lost is widely regarded as one of the most influential poems ever written. A retelling of the Book of Genesis, it depicts Satan’s war with Heaven, the story of Adam and Eve in the Garden of Eden, and their subsequent Fall from Paradise. Paradise Lost was a bold and revolutionary work at a time when religious dissent was considered heresy. Milton lived during a very turbulent period in history; a supporter of the Republican cause, he had written compellingly to justify the regicide of Charles I in aftermath of the Civil War, and was appointed Oliver Cromwell’s Secretary for Tongues. However, after the Restoration of the Monarchy in 1660, it became a treasonable offence to own his work and he was briefly imprisoned. His fall from grace, failing physical health and the dramatic events that surrounded the completion of his great work – the Great Plague, the Great Fire – are reflected in Paradise Lost. Due to late-onset blindness, he was forced to dictate the poem to others, which many say lends it its musical quality. The cultural impact of the poem cannot be understated. Milton is credited with inventing more English words than any other writer, including William Shakespeare. Paradise Lost was the origin of many words including self-delusion, self-esteem, outer space and pandaemonium. Paradise Lost has now been translated over 300 times into 57 languages. A recent book of research, Milton in Translation, found that the majority of those translations have been published in the last 30 years, often mirroring periods of ‘rebellious ideology or nationalism’. The Milton’s Cottage collection includes the Serbo-Croat edition, translated by Yugoslav communist party official turned dissident, Milovan Djilas, onto toilet paper in prison, and an illegal copy printed in Catalan during Franco’s regime. Audience members can simply turn up on the day or book via Eventbrite: https://www.eventbrite.com/e/paradise-lost-for-350-voices-tickets-36950981380 (entry by donation). There is also the opportunity to register to take part in the reading by contacting businessdirector@miltonscottage.org or 01494 872313. The Paradise Maintain’d Endowment Fund will go live at www.miltonscottage.org/support from Sunday 20th August. John Milton was born in 1608 into a century of revolution — in politics, print, science and the arts. By the time he died, in 1674, Britain had experienced the governments of three different Stuart monarchs, civil war, the Protectorate of Oliver Cromwell and its only Republican government. Milton was at the centre of this this turbulent period. Having postponed his early poetic aspirations to support the Republican cause, he served in Cromwell’s government as the Secretary for Foreign Tongues. During this time he devoted himself to polemical, theological and historical prose – much of which remains relevant to readers today through its exploration of personal, religious and political freedoms. Milton’s Cottage is the only surviving residence of the visionary poet and parliamentarian John Milton. Although he lived here for less than 2 years – after fleeing London during the Great Plague of 1665 – Milton’s Cottage was an important place in the writer’s life. It was here that he completed his epic masterpiece, Paradise Lost, and was inspired to write its sequel, Paradise Regain’d. Today this Grade I listed timber frame cottage is open to the public as a museum. It holds one of the world’s most important collections of Miltonic first editions on public display. It is also home to a unique literary garden planted with trees, flowers and herbs referenced in Milton’s poetry. It is the only cottage garden in the Chilterns listed by English Heritage as a Grade II registered historic garden. Milton’s Cottage is open from 1st April – 28th October 2017. Opening times are Wed – Saturday, 2-5pm (last entry 4.30pm) as well as bank holidays and the 4th Sunday of the calendar month (during the same hours). There is a free visitor car park next to the museum. Milton’s Cottage is overseen by Milton’s Cottage Trust (CIO), an independent charity established to preserve Milton’s Cottage, its garden and collection for future generations. The current Trustees are: Simon Avery (Chair); John Dugdale Bradley (Hon. Treasurer); Piers Hugo Brown; Timothy Butcher; David Hicks-Beach; Frederick Nolan; Jeremy Ryman; Timothy Simmons; Andrew Still (Secretary) and Karen Welch. Thanks to National Lottery players, we invest money to help people across the UK explore, enjoy and protect the heritage they care about – from the archaeology under our feet to the historic parks and buildings we love, from precious memories and collections to rare wildlife. www.hlf.org.uk. Follow us on Twitter, Facebook and Instagram and use #HLFsupported and #NationalLottery.